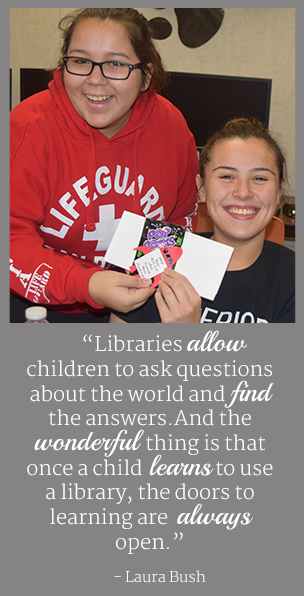 Our library/media center is a place that belongs to everyone: students, teachers, and staff. We strive to provide an inviting atmosphere in which each patron may become active and effective users of information. We promote a lifelong love of reading and learning and provide materials that support the academic goals of Superior Junior/Senior High School. The library is open from 7:30 a.m. to 3:30 p.m., including during all lunch periods. Students may come to the library before and after school as well as during lunch, provided they have a pass from the office. During class, students may come to the library with a teacher’s permission in groups of no more than three; otherwise, teachers will make special arrangements for the entire class to come together. Students may check out a maximum of three fiction or non-fiction print items at a time for a period of 10 school days. After 10 days, students may renew the materials as long as another student has not reserved the item(s). We have a collection of magazines and newspapers that must be used in the library. Students are responsible for the items they check out as long as they have them. Students may return all items directly at the front desk. If no one is available to check the item in, you may leave it in the red bin next to the circulation desk. There are no fines for returning items late; however, we will consider the item lost after 60 days, and students will be responsible for the full replacement value. Students may use library computers at any time, as long as a class is not scheduled to do so at the same time. All students must sign in and out when using the computers. Our library staff provides supervision to ensure safe Internet browsing, and we ask students to remember that school computers are for educational purposes only. Using the library is a privilege. In order to give everyone a positive experience, we expect all SJSHS students to abide by these rules of common courtesy.